NEW YORK (CNNMoney) -- In the Silicon Valley hierarchy, coders have always ruled the roost, but right now there's a different skill set on the industry's most-wanted list: designers. From giants like Facebook and Google to barely hatched startups, everyone is fighting over a small pool of artists skilled at bringing websites and apps to life. "There's a huge demand for finding talent," he says. "Just like with engineering, one of the reasons it's been so difficult is there just aren't many people that are that good. Not only are people looking for designers more than they used to, but the bar they're willing to accept has gone up." Several of the industry's power players have been on design-focused shopping sprees. In June, Facebook scooped up Dutch software design company Sofa. It was the first of many design focused "acq-hires" -- the industry's term for buying a startup to get hold of its staff. Two months later, Facebook bought Push Pop Press, a digital publishing company founded by former Apple (AAPL, Fortune 500) interface designer Mike Matas. The deal was aimed at bringing in the talented designer and his team, not the e-book software they'd created. Facebook made another design-focused purchase in December, hiring most of Gowalla's team to work on its Timeline profile redesign. Google left behind Gowalla's check-in service, which has since shut down. Facebook isn't the only one going after designers. When Google hired Digg founder Kevin Rose and a number of his employees from Milk, it made the unusual choice not to bring in the team's engineers. It wanted Milk's product and design talent -- especially Daniel Burka, the former creative director at Digg. His creations are elegant and whimsical, which is exactly the vibe Google wants to bring to Google+ and its social products. Google (GOOG, Fortune 500) attempted to buy Facebook founder Dave Morin's new company, Path, for the same reason, according to those with knowledge of the proposed deal. Google coveted the Path team's aesthetics and expertise in crafting intuitive mobile apps. For sites where Web designers gather, it's a new golden era. Dribbble, an invite-only site where designers show off their work and talk shop, has become a recruiting mecca. There are currently 25,000 designers on Dribble, with more than 60,000 waiting to get in. "We're backlogged," Dribbble co-founder Dan Cederholm says of the site he launched three years ago. "The demand has been high, and it's turned out to be a fantastic resource to discover designers." Apple and Google are among the companies that scout talent through Dribbble, he says. Dribbble's job board, which charges $200 per post, currently features ads from Facebook, ESPN, Yelp, Zappos and PayPal, among dozens of others. There's been a surge: Cederholm says Dribbble hosted a record 411 job ads last quarter, almost twice the number it had in the previous quarter. San Francisco-based 99designs, which connects designers looking for work with small businesses, is also enjoying the boom times. It raised $35 million last year in a funding round led by Accel Partners and has more than doubled its staff since then. "Demand for design is only increasing," CEO Patrick Llewellyn says. His site is now paying out $1.5 million a month to designers -- twice the volume it had a year ago. There are several catalysts at work. Manzari cites faster broadband speeds and better browsers as a factor. Designers can do things now that they simply couldn't 10 years ago, and the rise of smartphones and tablets gives them a new canvas to play with. Companies are also recognizing just how make-or-break design can be. Mint.com, for example, was far from the first personal finance website out there, but its elegant, intuitive style catapulted it to the front of the pack. Two years after Mint launched, Intuit snapped it up for $170 million. Veteran entrepreneur Rocky Agrawal cites Mint and recent phenom Pinterest as examples of companies that took off because of their visual flair. "The first 50 or 500 people that come to your site, the biggest thing that's going to impact them is the design," he says. "If you have great design, you can acquire the audience you need." 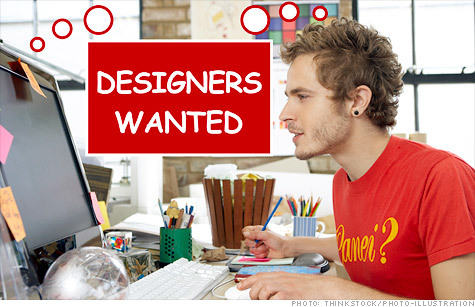 As the demand for designers increases, their salaries are going up as well. The latest AIGA/Aquent Survey of Design Salaries, a long-running industry benchmark, found that online designers command significant premiums over their print-focused peers. Those with specialized skill sets, like information architects and user-experience designers, now draw a median salary of $85,000. They're also moving up the career ladder. Apple's top designer, Jonathan Ive, is widely regarded as one of the company's most powerful executives. In its IPO filing, Facebook called out the two types of personnel it considers strategically vital: software engineers and product designers. Designers used to fall "somewhere between what an engineer would get paid and what the receptionist would get paid," Manzari says. "It was definitely a tier below in terms of salary and say in high-level decisions. I think that's completely changed."